With your assistance, we can offer a bright, hope-filled future. 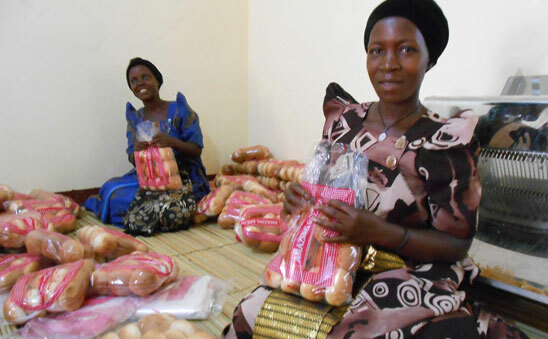 In the past, bread and other bakery products sold in Rakai and surrounding areas were transported from over 60 miles away and did not arrive on any regular schedule. Often weather, bad roads and lack of fuel meant that no bread was delivered to the area for some time. The bread which did arrive for sale in Rakai was old and very expensive. RODI determined there was a great market potential for bakery products. A bakery would bring income to women in the Hope Again Women’s program while at the same time providing an important service to the community. And so the Amazing Grace Bakery was conceived. Through generous donations from Grace Lutheran Church in Andover and gifts that came from communities from Maple Plain, Minnesota to New York City, the bakery has been built and is open for business. Generous donations funded a truck needed to distribute bread to local trading areas throughout the district. Thanks to you, the bakery is a bustling business in the heart of Rakai. Within the first two months of operation, the bakery was generating a profit. In February alone, the bakery produced 5,341 2-pound loaves, 9,218 1-pound loaves and 124,166 assorted buns. Each sponsored child received a 2-pound loaf of fresh bread at Christmas. And now the RODI team is developing new products and new distribution methods to increase revenue, with the goal of supporting more women and ensuring more children receive quality education. We are so grateful for the gifts that made this dream a reality! We are growing our email distribution list. Do you know of anyone who would like to receive updates? Send their name and email address to ann@africanchildrentoday.org. Make a donation to help fund another container of Feed My Starving Children food for children in Rakai. The last shipment will run out soon and another is ready to go – we are only waiting to raise the necessary shipping funds. Please pray for strength, wisdom and energy for Richard, Johnson and the entire RODI staff. And pray for discernment as they develop plans for our next project – a new boarding school for orphans!